In 16w32a, there was a bug (MC-105948) which didn't let you change language. 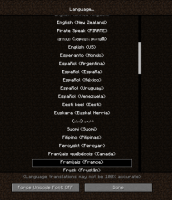 In 16w32b, the pre-selected language is English (US)… even if you have an another language already selected. For example, I'm French and play with Français (France)… but the pre-selected language is English (US), even if I have french texts. You can see this in the second attachment, where "English (US)" is selected… with french texts. Selecting the selected language fixes it.